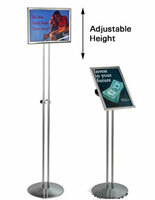 Snap Poster Frame: This sign stand, also known as snap frame is designed to hold any 22"x 14" graphics. 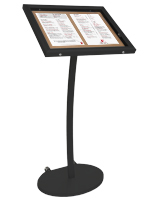 Media Size: 14" x 22"
sign holder: 22" x 14"
The sign stand, also known as a metal sign holder, can be used at the entrance of a cafe to display menu offerings. 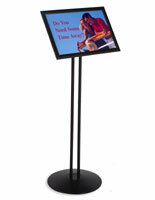 This free standing display has an upscale design which makes it perfect for hotel lobbies or car dealership promotions. 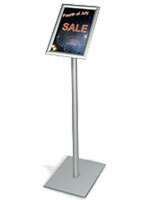 A sign stand can display sale signs at gift shops or other retail establishments. The sign frame borders snap open which allow you to insert printed graphics. A lexan covering protects your poster inside the frame. 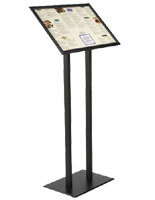 This metal frame , also known as a poster frame, ensures that inserts are sealed tightly by the clamps. 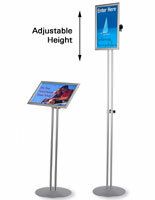 This sign stand is 22" X 14" which will be great for displaying your bigger graphics or menus. 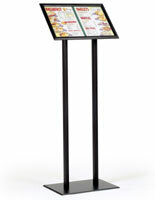 This free standing display, also known as a sign holder, has a base that measures approximately 16.75"W by 10.75"D. The total height is 48" tall. 23.0" x 48.0" x 11.5"